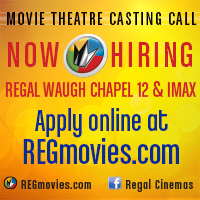 The Regal Cinemas Waugh Chapel Stadium 12 & IMAX is a 52,000-square-foot venue featuring 2,200 seats and state-of-the-art digital projection and RealD 3D. The theatre will show newly-released films along with alternative programming, sporting events and concerts. The Regal Cinemas IMAX Theatre is equipped with a speciallydesigned IMAX screen, and a powerful IMAX audio system delivering laser-aligned digital sound.